A few weeks ago my beloved cat Tucker snuck out the door around midnight and disappeared into the night. 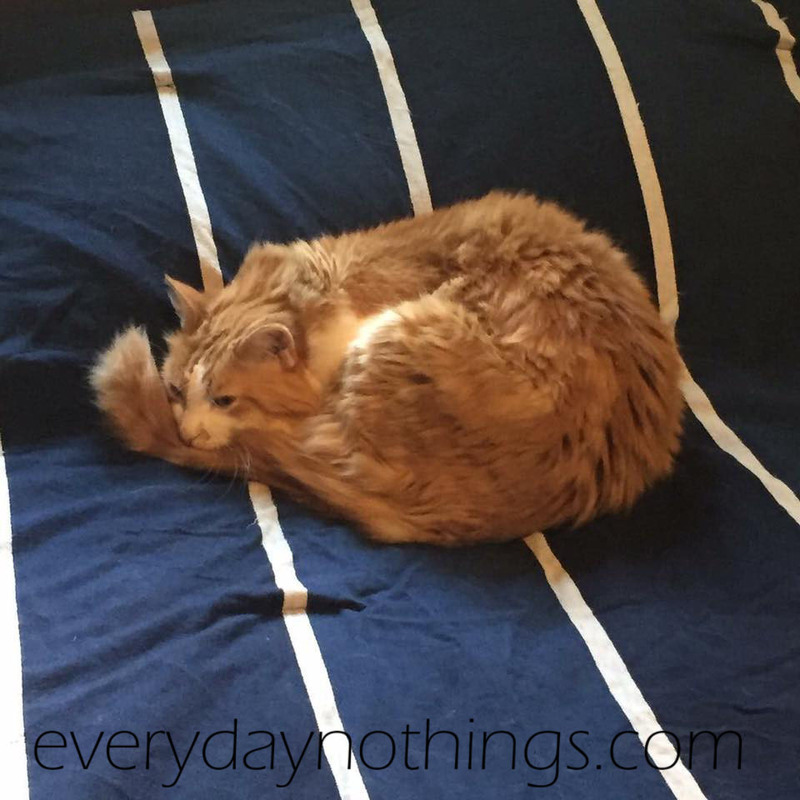 When he hadn't come home by the next morning, I became worried. Really worried. Tucker is 12 years old and an indoor cat. I envisioned all kinds of horrible things. But I also took action. If you ever find yourself in a similar position, here are a few things you can do to (hopefully) get your beloved cat (or other pet) back home. #1 - visit your local animal shelter. Our shelter helped me complete a "missing pet" notice, that would be kept in the intake area for six months, so that any cats brought in would be matched against Tucker's description. They also allowed me to view all of the cats at the shelter, including the recent intakes not yet available for adoption. I was also permitted to hang a "lost cat" flier on the bulletin board in their lobby. The animal control officer that assisted me was incredibly helpful and polite, and gave me some first-hand information on what they see that helps reunite owners with their pets. #2 - post on social media, especially Facebook. Truth be told, I did this first, just because it's quick & easy. Create a "lost cat" post, with picture, set the privacy to "public" and share with your friends. Ask them to share. Share in local groups in your area. Post in missing pet networks in your region. Post, post, post, share, share, share. Not only is it super-easy, according to the animal control officer I spoke with Facebook is now the #1 way they see owners reunited with pets in our area. #3 - post fliers, with pictures, in your area. This was one of the last things that I did, mostly because the three days after Tucker disappeared were filled with summer thunderstorms. Of course. But the first dry day we had I posted fliers on the telephone poles closest to our home, with plans to post more and expand the area every day. The officer told me this is currently the secondmost way they see pets & owners reunited in our area, especially for those who may find your pet but not be on social media. Even though it was too wet to post fliers outdoors due to the weather, I did take fliers to local gas stations, veterinary offices, and pet-related businesses in my area started on day one. We rescued Tucker from a shelter, so he came already microchipped, but this was the first time I actually ever needed to use their missing pet alert system. I have to say, I was impressed. I filled out the online form, submitted it, and not only did an email go out to hundreds of other owners of microchipped pets in the area (I've been getting their emails for years), but they also send out a mass communication to local veterinary offices, and even Facebook groups. In fact, one of the "Lost & Found Pets" groups that I went to post to, by the time I got on social media, had already posted the notice they got from our microchip company. For those who may be interested, we use HomeAgain*. 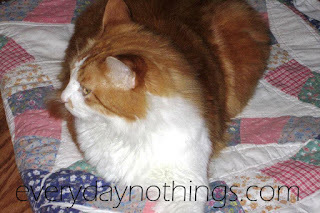 #5 - go out with stinky food and call your pet by name. For cats, go out in the evening and early morning. Cats are nocturnal by nature, so there's a chance he may be sleeping the day away. If he's going to be found out & about, it's most likely going to be at night. #6 - put your cat's litter box outside. Statistics vary, but some claim that a cat can identify their own litter box up to a mile away. I waited until day three to do this, for a few reason. First of all, I had cleaned the litter box right about an hour before he got out. There was nothing for him to smell. Secondly, Tucker shares a litter box with our other cat, Molly. I couldn't leave it outside with nowhere for her to relieve herself. Thirdly, the rain. I didn't clean the litterbox at all the first couple of days after Tucker disappeared. On day three, when the rain let up, I took it outside and dumped it near our property line, in the direction I last saw him running. It was now nice and stinky with Molly's waste, and I figured even if it's not his, he should recognize his sister's smell, right? According to the animal control officer I spoke with, indoor cats who get lost outside, if they haven't been taken in by someone, return after 2-3 days. If a cat has been "rescued" by a well-meaning neighbor, it can be months before you are reunited. The story usually goes something like this: well meaning person finds "lost" cat with no identification. "Rescues" said cat by taking it in. Since they are doing a good deed, it never occurs to them the cat may be lost. Surely it is a stray or its owners didn't want it or take care of it. 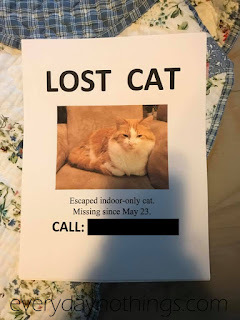 After a few months, the cat either isn't fitting in well in the household, or they finally get around to taking it to the vet, or a friend or family member guilts them about never checking to see if the cat were lost. At that point they surrender it to the shelter where it is scanned for a microchip or matched against a missing pet report. Or the vet scans for a microchip and realizes the pet actually belongs to someone else. Or they start looking at lost pet reports or call the shelter and realize that their new pet is actually someone's missing pet. So what happened to Tucker? He did return home, on day four, around 11pm. I heard a faint meow, and initially thought it must be Molly, sleeping in my three year old's room. Then I realized it wasn't her voice. I looked over, and there was Tucker, peeking in our French doors at the back of the house. He was skinny, covered in burrs, and reeked of gasoline, but was otherwise fine. I'm not sure where he was for those four days, but I sure am glad he's home. One surprising development was the amount of attention his disappearance and our reunion got on Facebook. People shared my posts all over and I was getting private messages checking on his status. So naturally Tucker ended up with his own Facebook page. 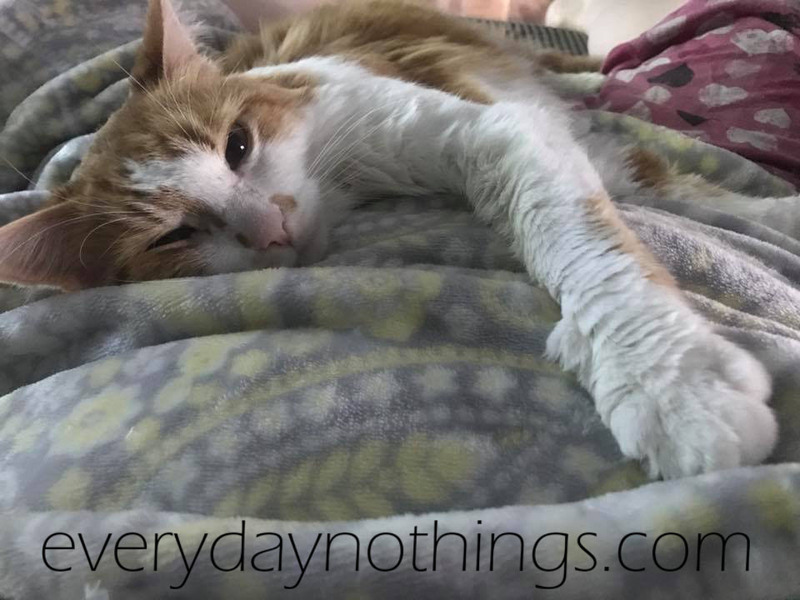 My cat has a Facebook page and people are still following his story. Still seems a little crazy, but it's true. How about you? Have you ever lost a pet? Were you reunited? What steps did you take when you realized it was lost? *HomeAgain did not ask for a mention or review, nor have I been compensated in any way for this post. I am simply giving my opinion of a service I have paid for out of my own personal finances.